Since 2010 when Metro began tweeting service alerts @metroLAalerts, more than 2,100 tweets have been posted — and it remains the best way for Metro riders out and about to get information. Alerts have ranged from “Wet weather safety tips-Do NOT run on train platforms or next to buses. Use handrails & onboard handholds. ^ST” to “Blue Line Update: Trains every 20 min to all stations. Bus shuttles cancelled. Harbor Transitway upcharge is waived today. ^ST” to a notice that the trains have been paused for examination following an earthquake. To send out service alert Tweets the only equipment necessary is a Twitter account (available for free at Twitter.com), a computer, a smartphone, accurate information and a person to collect that information and write a post in 140 characters or less. Most Tweets report service disruptions — planned or unplanned — that will delay customers. They include scheduled maintenance procedures like track grinding, new train testing or power systems work. They could be equipment malfunctions caused by severe weather damage, power outages or jammed doors. They might be police activity due to suspicious packages, trespassers on the tracks, medical emergencies or passenger disruptions. They could be due to traffic accidents, blocked lanes or tracks or protests. Or they could be the result of planned changes in traffic. This Sunday’s L.A. Marathon is an example. No two days are alike. Some days require more than a dozen alerts. Some days are silent. It just depends on what’s happening. Other alerts have warned of significant delays caused by news events, such as the violence that broke out near Staples Center in June, 2010, when the Lakers won the NBA Finals. Buses had to be rerouted to avoid the danger. It may be surprising that alerts are handled by only two people who collect information from bus operations control (BOC) and rail operations control (ROC), where dispatchers and controllers monitor buses, trains and stations around the clock and produce a steady stream of alert data. All that data is relevant to the people who run the system but much of it is not meaningful to the general public. That’s where the person writing the service alerts Tweet comes in. He or she reads the alert data, determines the importance to commuters and then translates what is sometimes complicated information into short posts. The messages are customer focused: How long will the delay be? Where should the customer wait for the next bus or train? Will this affect tomorrow’s commute? What are the alternatives? The goal is to minimize inconvenience to the customers. You don’t need a Twitter account to receive Metro service alerts via SMS text message. Simply text “FOLLOW metroLAalerts” to 40404. (Standard carrier text message rates may apply.) Or customers may sign up for a Twitter account and follow on @metroLAalerts or @metrolosangeles. (@metrolosangeles is another Metro Twitter account that contains both service alerts and general Metro information.) From there it’s possible to customize when you would like to receive alerts. Here’s more on the topic. 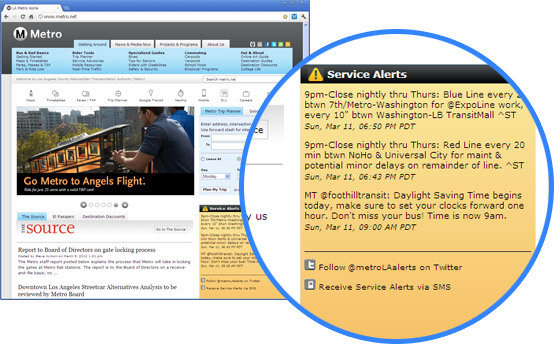 Service alerts also are posted on metro.net, Metro’s home page. The alerts generally cover activity from 4 a.m. to 1 a.m., although occasionally those hours may be extended. If, for example, an overnight situation that is supposed to be resolved by morning commute is not concluded, service alerts may signal the problem earlier than 4 a.m. so that customers can plan changes to their morning commutes. The Twitter accounts are a source of information but should not be relied upon during emergency situations on or around trains or buses. For emergency assistance, customers should call 888-950-SAFE (7233). On the rail lines customers can use passenger intercoms located in the stations. And the Twitter service alert authors? 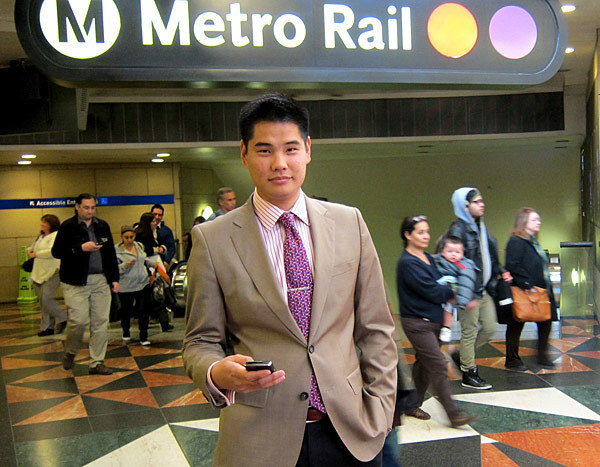 (^ST) is Stephen Tu (10 a.m. to 1 a.m.), who is an operations planner and service council representative for downtown, Hollywood, Koreatown and the Westside. Tu also works with the ExpressLanes congestion reduction initiative and maintains the metro.net planned service advisories page. (^GA) Gayle Anderson (4 a.m. to 10 a.m.) is a senior communications officer with Metro, who writes and posts press releases on metro.net, answers press queries and produces videos that run on metro.net and elsewhere. In their not very spare time they Tweet.